Update 12/26/13 : We’ve received dozens of entries with some remarkable photos and creative toasts, and below are some early favorites for the big prizes. Remember, the contest doesn’t close until the new year, so there’s still time to send a toast our way. Click the photos to check out the toasts. This holiday season, we are hosting a photo contest with Untappd called “Toast with the Most.” The rules are simple— submit a photo on an Untappd check-in of a Sixpoint brew (or brews) mid-toast, in an interesting setting, and write a caption that captures the moment. As always, creativity is king. The check-ins will be judged on photo composition, mise-en-scene, writing, and user engagement; the more toasts and comments a check-in gets, the better it is judged in that final category. The contest opens for entry on Friday, November 15th. The top six favorites will be announced on December 23rd, and entries close when the ball drops on New Year’s Eve. The six finalists will ring in the new year with Sixpoint Swag packages, and the Grand Prize winner will also receive a special NYE toast from Sixpoint. So crack a few Sixpoint brews and start formulating your creative toast photo. Get friends and family involved, and spread the holiday cheer with Untappd and beyond (Twitter, Instagram, Facebook) using hashtag #SixpointToast. 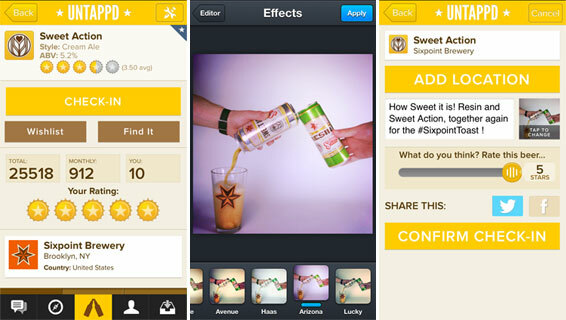 Untappd just added filters and enhancement tools to make your photos even more unique. This should be good.